Shawna P has a big voice; and she has the personality to match. Shawna P is as REAL as they come. Anyone who knows her will tell you, Shawna P is the truth. She is The Queen of the EarthFunk Tribe, The Funk Preacha, Pure Mother Earth Energy. She calls her original blend of music EarthFunk Muzik and refers to her supporters as the EarthFunk Tribe The best part about her is she never meets a stranger…Ever. She lights up a room with her song and her soul. Shawna P is not only a powerful voice, she's an accomplished singer/songwriter. In 2013, Shawna P was among 50,000+ hopefuls to audition for Season 4 of NBC's hit show “The Voice.”She was just another singer vying for her chance at success. Then the big call came! She was flown to L.A. from the Gulf Coast of Alabama (the “other L.A.,” as she calls it, referring to the moniker adopted by those who hail from “Lower Alabama”) and found herself in Hollywood among 230+ hopefuls. Then, after executive auditions, the contestants were whittled down to 130, prepped and ready to sing their hearts out to the backs of four big red chairs, that respectively seated four current mega stars in the music industry ( Blake Shelton, Usher, Shakira and Adam Levine of Maroon 5). 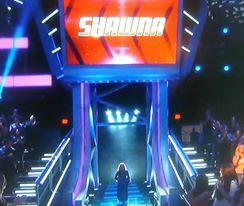 The unique grit and power of Shawna P's voice turned two of those big red chairs-- Adam Levine's “You have a voice on you. 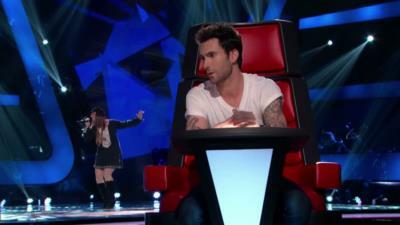 We want what you got.”and Shakira's-- landing her a spot on Season 4 of The Voice. Needless to say, Shawna P's life changed forever. She would be singing on the #1 television show in America, NBC's “The Voice,”and the world would finally hear what her fans have been enjoying for years. America immediately fell in love with the Southern funk,soul rocker from Alabama and so did international superstar Shakira, whom Shawna P strategically chose as her mentor. As Shakira said, “Your voice needs to be on the radio today. YOU are exactly what we are missing. You have so much rock and roll inside of you,” Shawna P did not disappoint her fans or her coach, charting in the Top 200 on iTunes, and gracefully beating out the competition to make it to the top 32-- out of 50,000 singers who initially auditioned for the show. Shawna P confidently yet humbly began pulling at our heartstrings with her raw, emotional style of singing and, seemingly effortlessly, cast her own enchanting web of southern grit and flavor on classics from The Black Crowes, Janis Joplin and Paul McCartney (Shawna P, on the other hand, brought an almost religious fervor to “Maybe I'm Amazed” that unearthed a bluesy, world-weary side of the song I never knew existed- Michael Slezak, .. If only she could have performed some of her signature EarthFunk Muzik for those coaches, she may well have won the whole competition. Shawna P has been writing and interpreting her own songs for years and even secured a coveted publishing deal while performing with the Muzik Mafia in Nashville, where she lived and honed her craft for 12 years. 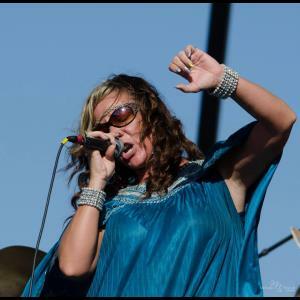 While living and performing in Nashville, Shawna P shared the stage with great artists such as Kid Rock, Charlie Daniels, George Clinton, Big & Rich, Gretchen Wilson, James Otto, Scott Weiland (of The Stone Temple Pilots), Donnie Van Zant, Robert Randolph and even recorded a duet of her original song with the legendary Michael McDonald. Since appearing on NBC's “The Voice,” Shawna P has garnered praise from Rolling Stone magazine- “Shawna P mopped the floor with her rendition of Janis Joplin classic “Piece of My Heart”, People magazine, and E-Online. among others. She even received a personal message of praise and support from vocal phenomenon Kelly Price. More importantly, she has encouraged people of all generations to never stop dreaming and never stop believing in their dream. Out to prove that it's never too late to become what you are destined to be, Shawna P is revived and stronger than ever. Nowadays, she has her sights set on “EarthFunking” the world. For booking info or vocal coaching, please e-mail Shawna P directly@ shawnapsings She'd love to hear from you and will show you true Southern hospitality! She'll make you feel like you've known her for years--as they say down on the Gulf Coast...Gua-ran-teed. Please note Shawna P will also travel to Semmes, Theodore, Eight Mile, Grand Bay, Irvington, Wilmer, Saraland, Bayou La Batre, Coden, Hurley, Satsuma, Pascagoula, Spanish Fort, Daphne, Creola, Fairhope, Chunchula, Moss Point, Saint Elmo, Lucedale, Escatawpa, Bucks, Axis, Citronelle, Dauphin Island, Loxley, Gautier, Silverhill, Bay Minette, Magnolia Springs.